I’m thinking about perfection today. Have you ever had something perfect? I’m not sure why, maybe because I’m also thinking about grandmothers today, but what comes into my mind is the memory of a pair of boots. On Christmas in 1974, when I was six, I opened a present from my grandmother that was a pair of boots that I’d wanted. I don’t know why I was so crazy about them but I was. It’s the only pair of boots I’ve ever owned in my life. I was amazed that she knew that I’d wanted them. I’d never told her. “How did you know?” I said. I was ecstatic, and since I was ecstatic she was happy, too. “We grandmothers have ways,” she said, smiling. She had a low, scratchy voice from a lifetime of smoking Parliaments. I went to sleep that night with my boots by my bed so I could look at them as I fell asleep. I wore them the next day and kept peeking back at them as I walked. When I was that young, objects had a kind of magic about them. When I started to collect baseball cards heavily a few months after getting my new boots, I brought to those cards the same ability to be wowed. This 1975 card of the ace of the Oakland A’s surely wowed me, first pulling me in by the imagined game of catch occurring between the pitcher and the person he was staring in the eyes. The thrill of playing an imaginary game of catch with a major leaguer increased with the intimations of immortality on the back of the card. First, there was the unprecedented focus of the trivia question on the subject of the card. In most, if not all, of the other 1975 back-of-the-card trivia questions, the information did not concern the player on the card, but Jim Hunter rated special treatment, the question asking, “What is Jim Hunter’s nickname?” The answer is upside down below a cartoon of a mustachioed player holding a bewhiskered fish. 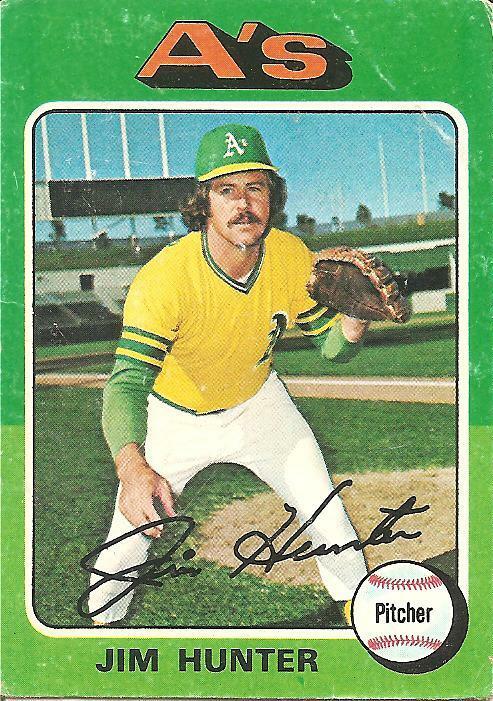 And after turning the card upside down to learn that Jim Hunter is in fact Catfish Hunter, the perfect baseball name, I turned the card rightside up again and scanned the numbers, the wins piling up in a satisfying repetition of twenties. I didn’t know a lot about baseball yet, but I knew the difference between winning and losing, which was the difference between good and bad, and I learned early on that a pitcher with twenty or more wins in a season had a kind of monumental solidity unmatched by anyone else in the game. And Catfish Hunter won twenty games year after year after year. My brother and I had a baseball encyclopedia in our room. In it, Catfish Hunter appeared on one of the shortest of the many lists. His entry to that list came a few months after I’d been born, when he threw a perfect game. Yesterday Hunter was joined on that short list by another member of the A’s, Dallas Braden. After pitching his perfect game, Braden embraced his grandmother, Peggy Lindsay, who had raised him after his mother died of skin cancer when he was in high school. Braden had been in the news earlier this season for chafing at Alex Rodriguez stepping on the mound that Braden was using. After that game, Rodriguez implied that Braden was a nobody and should keep his mouth shut. You know who will disagree with the opinion that you’re a nobody? Your grandmother. If anybody tells you you’re nobody, ignore it and go with what your grandmother would say. Your grandmother knows. After Braden proved yesterday that he never was and never would be a nobody, his grandmother had a message for the Yankee star and his image of a rigid hierarchical world with select celebrities on top, perfect, and everybody else below. “Stick it, A-Rod!” she said, smiling. When you’re very young, you believe there are good things, maybe even perfect things, and you grab onto them with all your might. You don’t want them to change. A few days after I got my new boots, the wonder already wearing off, Catfish Hunter signed as a free agent with the New York Yankees, making this card a lie before it ever reached my hands. When I look at this card now, I don’t see myself as part of the game of catch. I see a turning point of sorts. The 1970s turned right here, in this 1975 Catfish Hunter card. The ace of one of the best-ever baseball dynasties is pretending to play catch. He waits for the ball to return. His throwing partner will not return the ball but will point out toward the sky beyond the outfield stands. The game as you’ve known it is over. You’re free to go. It’s a liberation. It’s an erosion of roots. A blessing, a curse. Free to go. You are currently browsing the archives for the Jim Hunter category.